US News & World Report will announce the rankings of universities around the world. UC News & World Report ranks 12 sections, including university research results and global and regional reputations, and scored the average score. Harvard University ranked # 1 in the world's best university rankings by 2016, among 750 universities in 60 countries. Harvard University has achieved 100 out of 100 points, confirming that it is the best university in the world. Click on the table below to see the top 750 university rankings in the world. MIT ranked second with 94.3 points, followed by UC Berkeley (92.2) and Stanford (89). 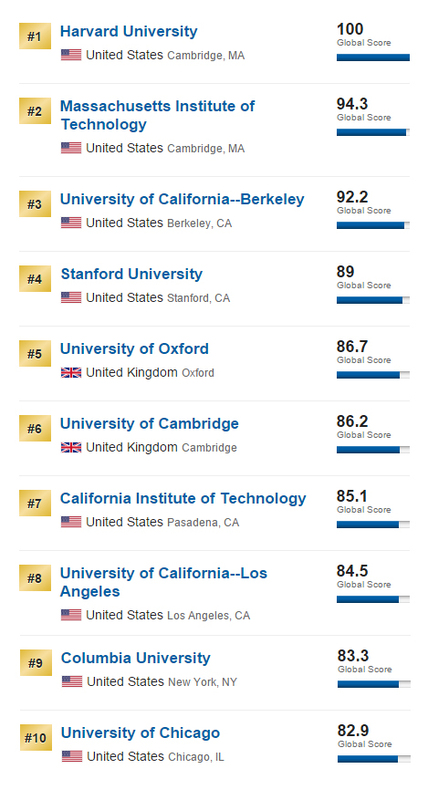 UCLA (84.5 points), Columbia University (83.3 points), Chicago University (82.9 points), Caltech (85.1 points), UCLA (84.5 points), and Columbia University (82.3 points) were the top universities in the UK and Cambridge. ) Ranked 7th to 10th, and 8 of the top 10 universities in the world were ranked by American universities. In addition, MIT ranked second with 94.3 points, followed by UC Berkeley (92.2) and Stanford (89). UCLA (84.5 points), Columbia University (83.3 points), Chicago University (82.9 points), Caltech (85.1 points), UCLA (84.5 points), and Columbia University (82.3 points) were the top universities in the UK and Cambridge, with 86.7 points and 86.2 points, respectively. ) Ranked 7th to 10th, and 8 of the top 10 universities in the world were ranked by American universities. UC Davis (39th), UC Davis (39th), USC (44th) and UC Santa Cruz (48th) are among the top US universities in the California region, including US San Diego (19th), US San Francisco It is included in 50 university rankings, and it is known for excellence. Among Asian universities, Tokyo University in Japan was ranked 31st, Beijing University ranked 41st, and Singapore National University ranked 49th. On the other hand, Seoul National University received 65.4 points for Korean universities. See Table 2> A total of 17 Korean universities were included in the top 750 universities in this evaluation. "When students and parents set goals for studying and studying at home and abroad, we set up a university rank to help them find the right school for them," said Robert Moss, US News Data's chief executive. "Now is the global age. "The number of students studying will increase."